Tricks or Treats, Samhain has come! Halloween and Samhain are here -- how did the end of the year come so quick? So much to reflect on, the day already feels like it's simply whizzing by. Thankfully Samhain isn't simply celebrated on today, the 31st. Each tradition is different; when I was in BFC we observed Samhain on November 7th; many traditional Pagans celebrate on October 31st, others continuing through to November 2nd, as well as getting the opportunity to celebrate once more when Lunar Samhain rolls around. This many days of celebrations? Jai Ma!! I was going to go to my old covenmates tonight for ritual, but she has informed me that she was just exposed to H1N1. She works as a nurse so I imagine being exposed to a variety of illnesses is fairly common, I trust she will be well but sending her light none the less. So, tonight I plan to stay in and enjoy the evening after taking Nimue trick-or-treating. I don't know why, but in general I tend to get a little surprised by people who don't know what EPC is, more particularly spiritual people. Really? Most people have practiced this and have no idea, and in fact I would say that's true about 98% of the students I teach. I suppose it's just the label of which we define it that might not make sense to people, I know I'm certainly one of them at times. If you don't know what EPC is, it's Etheric Plane Communication. The basic way I like to start discussing this with my students is that it's communicating with another being on the etheric plane. Some will go as far as to describe the etheric plane as the dream plane, though I don't equate the two as being the same, but that's a discussion for another day. I've been waking up late the past several mornings, mostly due to the cloudy haze and darkness that it still feels like 4 or 5am, so needless to say I go back to sleep. Today I was up early, awoken from strange dreams, the rain has me wanting to curl up with several good books. Or to study. Or knit. Clearly I can't make up my mind this week. 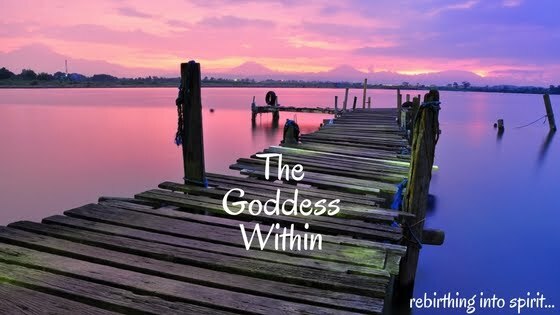 What brought me to the Goddess? It's Monday. Somehow I'm not in October and the month isn't drawing to an end and Samhain isn't just right around the corner... I had so much planned for this month, however the energy of this month had other plans for me, which has proven to be necessary, but the return to commitments is more prominent than ever. Friday my brother-in-law and his girlfriend took us out to Witch's Woods since she wanted to go on a haunted hayride, which I admit to have never experienced, and by the next day my throat was completely soar and stripped of any dignity from all the screaming I did. Serious wimp! But it was quite a blast and I think we all needed that. We needed a day to laugh and be silly and ridiculous, and I'm pretty sure my general reaction to the haunted happenings surrounding me provided much comic relief more than the actual event itself. I feel like a week has gone by, disconnected from the cyber world and anything else outside of my immediate bubble, I have held space for those who needed me to share my strength while finding my own renewal in the process of release. The wake was yesterday, and I hadn't anticipated actually getting to physically see Joe there. I was told he would be cremated. And he will be, today, but I thought it was happening the day before, so I had images of seeing his urn and his picture there, not him, himself. That took me back. As I've said before, this is a new process for me, I have only been to 2 other wakes. One was my stepfather's mother who, out of the 3 kids, I was the only one who met her a couple of times, so he asked me to go, and I did, to support him. He asked me to go to the casket, and again I did, but I didn't stand too close, it was a strange notion being there. I have this song in my head at the moment, singing over and over the line "and the days go by". The days certainly have felt like they have gone by, quite fast, like months have been processed through in mere days. Days. Just days. It's a strange place to be, but it's the moment, this moment. It's now. The wake is tomorrow. While death itself isn't easy, and I'm certainly no authority on it since I haven't experienced it much around me (thankfully), it's a completely different field of energy than I can speak on. It's one of those days where whatever intention you had in mind seems to simply disappear without much thought. I'm at a loss for words, and I'm processing through a loss that I'm not sure how to process through just yet. I was supposed to be at Christopher's workshop/fundraiser today, was quite excited about it, looking forward to connecting with new people and just being able to be part of something so fun, but this morning about a half hour before I was set to go, unable to fight back tears, I called and pulled out. This week felt like it went by too fast. October has felt like it's been going by too fast. Halfway through the month, just too fast. When did life really begin to "fly by" as adults and stand still for children? Perhaps that's why the joke is that I don't live much in linear time due to my being in touch with my inner child. I feel like I come in and out of reality as I balance the work and play. I always seem to find a tough balance between blogging and actual physical journaling. If I blog, I journal less, if I journal more, I blog less. The stream of consciousness is completely different in both fields, despite that it's all introspective work, I'm more open there, in paper form, where it's not available for the world to see. Thoughts are jumbled even more at times, but I'm also willing to admit my personal truths to myself, seemingly out loud, and process from there. I like the notion of blogs relative to keeping connection with another, or perhaps meeting someone you haven't met before and connecting with their words. It's much more personal than networking sites such as Facebook, though that has it's own superficial purpose that I enjoy, so I can't complain. I've been craving this sense of community, in my mind I can see what it is, and while I'm not sure it entirely exists, yet, in this plane, I know it's there, somewhere, and I've been connecting to that desire, however, my sense of wanting a community and the ability to actually vocalize, completely, what that is is two different things, and I realized just moments ago that part of my desire and expression may be coming to some sort of fruition, just not in the capacity I had initially hoped or suspected. Yesterday completely threw off my week with it being a Monday but feeling like a Sunday. Most observed holidays don't affect me much, I'm one of those people who will go to the post office or library on observed days and wonder why it's not open. Those who know me fairly well joke that it's because I don't live in linear time. Still, not an excuse to not at least pay attention to what's going on in the now, even if my "now" tends to be without borders. It's cold today. Crispy, New England kind of cold today, fabulous! Though I spent the morning sleeping in from a headache late last night and then tending to laundry and domestic things, there will be plenty of time to enjoy it outdoors. I wanted to decorate for Halloween this year, had so many plans but never got around to it. Between classes and other obligations that took me away from home I never sat down long enough to get it done before October began as my original plan was. While there is still time, I won't be decorating since things must come down, not back up. We're planning on packing away small items, taking things off the wall, the things you do when you've made the choice to move away, and this is, really, the first time I've ever moved where I've had more than a week to do it. First time ever... I honestly don't know where to begin. I'm used to throwing things in a box and going, boom, done. Now? Plenty of time, essentially. I've been listening to Chad's live CD a lot the past few days, loving the introspection his words always bring me, and the one song that's been playing over and over in my head, "Guarded", has this line that chokes me up every time I hear it, "There are days I swore I'd give up... but that's not today... that's not today..." It hits home in so many ways, and makes me smile in reflection. While I love naps and only get to have them once in a blue moon, they completely throw off my day if I choose (or seem to fall easy prey) to take a nap during a busy day. A day planned and planned well only to be mocked in the face of a nap. It was a good nap, but still, throws me off my day. I'm looking at the next 3 months and attempting to schedule everything in a an easy flow. It looks good on paper, much of it seems to be spread out fairly well, I'm hoping that it'll translate well in execution. It went from the start of some fall chilly weather to muggy and warm... fall, where are you? I feel it necessary this time of year to snuggle under my blanket, to drink hot chocolate and taste the chill in the air. I want my chill! I suppose it'll come soon enough, and for those who have complained and felt as though there was essentially "no summer" I guess I can wait. I, myself, would rather be living in 3 seasons where summer is pretty non-existent... then again it does possess some wonderful things, but today I want my fall back. I had ritual last night after putting Nimue to bed and I focused on my journey to my inner temple to meet with my ancestral teacher and get some guidance relative to the cultivation of peace and compassion in all aspects of life. It was extremely helpful, and I was enlightened with various information from 2 of my other guides. Today I feel more productive, more movement flowing. It feels like today Mercury went direct, for the smoothness of everything is just so perfectly aligned. It's raining today. The gloomy sort of rain, which is perfect for introspection, which in the early hours of today I have done, and it brought an awareness that we're in October. Not just the month, but the energy of what October brings in all its facets.